Tag line: "'TREMENDOUS! BRILLIANT! SUPREME!'...N. Y. Times"
Henri-Georges Clouzot’s The Wages of Fear is a tale of desperation, the story of four men who accept a dangerous job to escape a life of poverty. What makes the film so effective is that it presents not only the peril (which is intimidating, to say the least), but the destitution as well, revealing, in no uncertain terms, the reasons why these men chose to risk their lives in the first place. 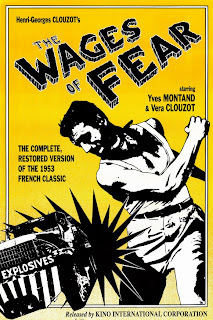 The Wages of Fear presents both cause and effect, and after all is said and done, we’re not sure which of the two situations was worse. It’s hard to find a good job in Las Piedras, a small Central American town controlled by a large U.S. oil company. That is, until the day the company sends out a call for four long-distance truck drivers, promising excellent pay for anyone lucky enough to be chosen. The catch? These four will be transporting trucks loaded with highly volatile nitroglycerine, meaning the slightest bump could result in a disaster of deadly proportions. The four men selected; Mario (Yves Montand), Jo (Charles Vanel), Bimba (Peter van Eyck) and Luigi (Folco Lillu), are penniless, and willing to take their chances on the open road for the promise of large paychecks. Unfortunately, fate and Mother Nature have teamed up to transform this particular journey into a living nightmare. Director Clouzot effectively captures the terror of the expedition, bringing us along for every hair-raising moment of it. Each bump, each turn elevates the tension a notch at a time, and it doesn't take long for it to start wearing on the four drivers. Just before setting out, Jo, who was the bravest of the bunch, had comforted a worried Mario, telling him that everything was going be okay. The open road, however, proves too much for Jo to bear, and his nerves deteriorate rapidly, reducing him to a quivering wreck. Under normal circumstances, we'd be wondering why anyone would have taken such a job in the first place? But we don't need to ask, because director Clouzot establishes the 'why' early on, by bringing us inside the community of Las Piedras. With no work and very little opportunity, Las Piedras is nothing more than a ghetto, a place where once-proud men have been reduced to begging for spare change from ice cream vendors. When Jo first arrived in town, Mario informed him that the only jobs to be had were odd jobs, which paid just enough for a single day’s food and drink. Everyone in Las Piedras is holding out hope that a situation will come along that pays enough for a one-way ticket out of town, so when the company puts out a call for truck-drivers, a position that promises a $2,000 payday, how could any of them possibly pass it up? The Wages of Fear gives us equal doses of tension and drama; revealing the reasons men risk their lives, and the depths to which doing so takes them. Looking for a way out of a town they’ve grown to despise, these four lay everything on the line, never once dissuaded by the fact that their ticket to freedom is strapped to thousands of pounds of explosives. So what if the journey costs them their lives? In Las Piedras, they were dead already.